Flavor: minty with a hint of wintergreen. 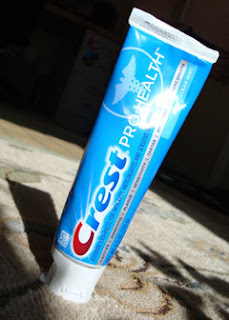 Color: blue gel, though less transparent than some. Texture? that's where it shines. There is just a little fine grit that leaves my mouth feeling very clean. If you can find it on special, go for it. My buddy Tom, a film producer and director, recently visited Milano, Italy, the world capitol of design. 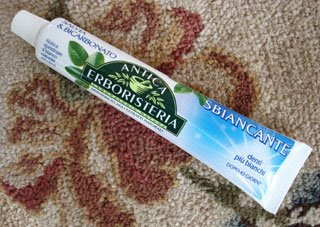 He was kind enough to bring me back a tube of Antica Erboristeria herbal toothpaste. This variety is "Salvia & Bicarbinato". I'm sure you can guess the Bicarbinato part - baking soda. The Salvia part, I had to look up - sage. You could probably also guess the translation of the company name: old herb emporium. Apparently the company dates back to 1783. But now it's part of the Schwarzkopf & Henkel family of fine products.